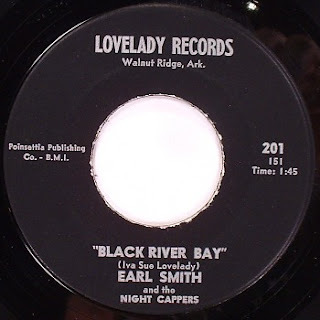 Not very much is known about Earl Smith, except that he was the vocalist and guitarist of the Night Cappers from Arkansas. Smith got to known the three siblings Randell, Carrell, and Laveral Rogers from Beech Grove, Arkansas, around 1958 and began to play with them. Smith, who hailed from Stanford, was a good guitar picker and liked to play like Luther Perkins. During these early years, he and the three Rogers siblings played on private house jam sessions but hadn't organized a band yet. It was probably in the late 1950s when the Night Cappers were founded. The band members were Earl Smith (vocals/electric lead guitar), Randell Rogers (electric rhythm guitar/vocals), Earnest Stracner (acoustic rhythm guitar/vocals) and Laveral Rogers (drums). Stracner was a cousin of the Rogers and was said to sound like Ernest Tubb. Although still in their teens, the Night Cappers played clubs and bars every night well into the morning hours, mostly with Smith's older brother James as the overseer. The next day, Smith and the other band members went to work on the cotton fields again (except for Laveral, who went to school). The group played in Northeast Arkansas and Southeast Missouri, including the Bootheel Club, Wink's in Paragould or the Cozy Corner in Delaplaine and many others. In late 1961 or early 1962, the Night Cappers were discovered by Iva Sue Lovelady, an older woman who was in the music business for some years then. She was born on May 26, 1917, and married Homer James Lovelady. She died on July 4, 1999. One of her earliest efforts in the music business was her song "Please Come Back," which was copyrighted in 1938. She owned the record label Lovelady Records in Walnut Ridge, Arkansas, and composed "Black River Bay" as well as "Silly Quarrell" for the Night Cappers, who cut both songs in the spring of 1962 at Joe Lee's Variety Recording Studio in Jonesboro, Arkansas. The record was a good seller in the region and soon, Sam Phillips was interested in the group but somehow, nothing came of it. Even if Phillips would have arranged a session for them in his new recording studio in Memphis, success probably would have eluded the Night Cappers, considering that Phillips golden years as a producer were over by 1959. Eventually, the Night Cappers disbanded. No information seems to have survived on what happened to Earl Smith, while the Rogers family still made music for their private pleasure. "Black River Bay" has been compiled on three different rock'n'roll compilations, first time in 1980 on the White Label LP "Rock from Arkansas." Iva Sue Lovelady is my grandmother. I would like to learn more about her music. I'm sorry but this is all info that I have. News flash Earl Smith is my grandpa and he died in January 20 around 4:00 am. He had cancer in the will he gave me some instruments that were valuable to him. I miss him so much. I'm sorry to hear that. Your grandpa was a very accomplished musician. Is there a possibility to ask you a couple of questions about him? Possibly through email?